At first, it is the lovely spiral design of this Chocolate Sponge Cake that catches people's attention. But after one delicious bite, its light and airy texture that seems to just melt-in-your-mouth, is what everyone will remember. 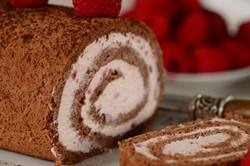 I love the rich chocolate flavor of this sponge roll, and while I often fill it with a plain or chocolate whipped cream frosting, this time I decided to flavor the cream with raspberry preserves. The good part is that it can be stored in the refrigerator for five days, although I have never had one last that long. When I decided to review Rose Levy Beranbaum's 'Cake Bible', this is one of the recipes I decided to make. The beauty of any sponge cake is that you only need the most basic of ingredients. The tricky part is to make a sponge with good volume, for while a butter cake relies on baking powder to do this job, a sponge cake relies solely on the beaten egg. When I consulted 'The Oxford Companion to Food' on this subject Alan Davidson aptly explains that a good sponge "starts with prolonged whisking of eggs and sugar which incorporates air, distributing it through the mixture as tiny bubbles. During baking the air expands, leavening the mixture with a network of little holes surrounded by walls of coagulated egg proteins; hence the name 'sponge cake'." This explanation tells us how important technique is and that once you have perfected the beating of the yolks and whites to full volume and then are able to add the two together without deflating the batter, you will produce a perfect sponge cake each and every time. Now, this chocolate sponge cake is a little different from most in that it does not contain flour which makes for a very light and moist cake. I like the texture as it reminds me of the molten chocolate cakes or maybe a baked chocolate mousse. But the downside is that the sponge is quite fragile, so it will crack when you roll the cake around the filling. It does contain melted chocolate, and make sure the chocolate has cooled to room temperature before adding it to the beaten egg yolks and sugar. The instructions say that once the chocolate sponge is baked, a damp cloth is laid over the still warm cake, as this will keep it moist as it cools, which does help prevent cracking. The chocolate flavor in this cake is lovely which allows us to fill it with a variety of flavors. Because of its light texture and taste I like to pair it with one of the Whipped Cream Frostings; either plain, chocolate, raspberry or strawberry. Chocolate Sponge Cake: Preheat oven to 350 degrees F (180 degrees C) and place the oven rack in the center of the oven. Butter, or spray with a non stick vegetable spray, a 17 by 12 inch (43 x 30 cm) sheet pan. Line the pan with parchment paper and then butter and flour the paper (or spray with vegetable/flour spray. While the eggs are still cold, separate the eggs, placing the whites in one bowl and the yolks in another. Cover with plastic wrap and bring to room temperature before using (takes about 30 minutes). Meanwhile melt the chocolate in a stainless steel bowl placed over a saucepan of simmering water. Let cool to room temperature. In the bowl of your electric mixer (or with a hand mixer) place the egg yolks and 1/4 cup (50 grams) of sugar and beat, on high speed, until this mixture is thick, light and fluffy (about five minutes). (When you slowly raise the beaters, the batter will fall back into the bowl in a slow ribbon.) Beat in the vanilla extract. Add the melted chocolate and beat only to combine. Set aside while you beat the egg whites. In a clean mixing bowl, with the whisk attachment, beat the egg whites until foamy. Add the cream of tartar and beat at medium-high speed until soft peaks form. Gradually beat in the remaining 2 tablespoons (30 grams) of sugar until stiff peaks form. Gently fold a small amount of the egg whites into the egg yolk mixture using a rubber spatula or whisk to lighten the batter. Fold in the remaining whites just until incorporated. (Don't over mix or the batter will deflate.) Spread the batter evenly into the prepared pan with the back of a spoon, or an offset spatula. Bake until the cake is puffed, has lost its shine, and springs back when gently pressed, about 15 - 17 minutes. Remove from oven and place on wire rack to cool. Cover the cake with a clean, slightly damp towel. Raspberry Whipped Cream: Place your mixing bowl and whisk attachment in the freezer for 15 minutes. Then place the whipping cream, vanilla extract, and sugar into the bowl and beat until soft peaks form. Add the jam and beat just until stiff peaks form. Once the cake has cooled, spread with the whipped cream and gently roll the cake, peeling off the parchment paper as you roll. Can be covered and stored in the refrigerator for up to five days.